…By the Way, So Does Pharmaceutical Sales! As someone who spends a lot of time providing medical sales training, I’m all too familiar with pharmaceutical sales reps who use the detailing sales model to sell (I use the word sell with hesitation). 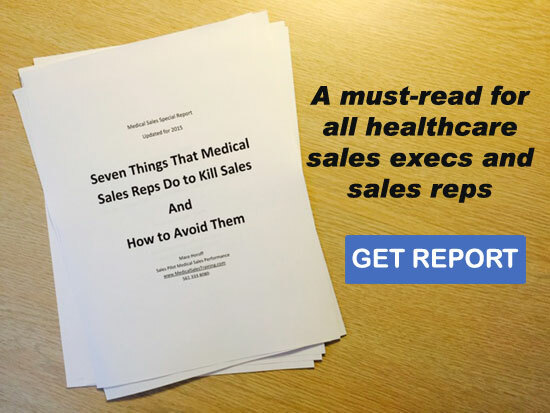 What’s sad are the number of medical device sales representatives using the same approach. Attempting to sell to healthcare professionals by detailing is amateurish and ineffective. What is the pharmaceutical detail model I’m referring to? It’s when pharmaceutical reps get in front of a doctor and spew all the details of the drug they’re selling in one minute or less. Pharma reps do this for many reasons. One reason is because it’s the way they’re taught. Another reason is because of perceived time pressure. They know if they spend longer than a minute reciting their canned sales presentation, the doctor will become irritated. Pharma reps sense that most doctors don’t want to listen to their spiel anyway. After all, that’s why pharmaceutical reps resort to focusing on delivering lunches and free samples—activities that often garner a minute of a busy doctor’s time. Selling this way makes a sales representative little more than a walking, talking brochure (who again, often brings lunch). Brochures are boring. Most pharma reps are boring. Boring doesn’t sell well because boring does not convey value. When Medical Device Sales Representatives Sell Like Boring Pharma Reps? The reasons medical sales professionals resort to detailing tactics are similar. They sense time pressure and want to be brief. Many lack medical sales skills, so they just recite features and benefits and whatever they think might stick. Their sales planning consists of reading over a product brochure and adding a dose of hope instead of strategic planning and a targeted sales approach. What really blows me away is the frequency with which I encounter medical device reps who say something along the lines of, “Selling my product is more like a pharmaceutical sale. Our goal is to get the doctor to write a prescription. We get in, tell our story and get out.” Again, sounds more like hope than gaining commitment. By the way, does the doctor get to talk? When you barge in, dump data and run out, you’re not delivering value; you’re delivering an interruption—one that doesn’t serve your end goal very well. Value Selling Requires a Conversation – NOT Detailing! Imagine you’re a doctor or other healthcare professional. What is the value of a salesperson? No, it’s not someone who shows you products and services in case you should ever need them. A salesperson provides value when helping customers to identify hidden problems or recognize unseen opportunities. Of course, the salesperson is compensated when he or she can strategically position a product to solve said problem or leverage said opportunity. Real selling requires a conversation…oh yeah, and something else: Listening! It’s not about the salesperson doing all the talking. It’s about asking the right questions and getting customers to reveal their thoughts, needs, goals, and concerns. Without clearly identifying and validating these areas, detailing or spewing data, features and benefits is a waste of time. And it’s freakin’ boring! Did you ever notice when someone engages you in a conversation about something you want to talk about you don’t feel the urge to rush away? If you’re receiving valuable insight and information, do you want to talk more and know more? I’m sure every pharmaceutical sales rep would answer these questions with a resounding “yes,” yet most sell using a model that delivers the opposite. It’s nuts! A good share of the medical device hiring managers I meet toss resumes that say “Pharmaceutical Sales Representative.” It’s because they consider pharmaceutical reps to be little more than sample drop-off people (and food deliverers). They have a perception that pharmaceutical sales people don’t actually sell. Yet, they’re unaware of similar behavior in their own ranks. Sales reps are grateful for whatever time a doctor gives them. They try to make the presentation fit the time. That’s not always a good decision. If what you sell is valuable; if it makes a significant difference in how a healthcare provider delivers care and it improves patient outcomes, it’s worth more than a one minute data dump. You cheapen yourself and your product when you try to sell this way. What should you do when a customer says he only has a minute? Sell the customer on the value of spending five minutes with you, or 15…even 30. Don’t think it’s possible? It is if you can describe in tangible terms what the customer will get out of spending the time with you. It doesn’t matter if you’re selling pacemakers or aspirin. If you don’t believe it’s worth the doctor’s time to spend more than a minute with you, why should he? If you want to deliver food, get a job driving for Dominos. If you want to sell medical devices, or pharmaceuticals for that matter, learn how to have an engaging and compelling sales conversation that delivers value. By the way, if I offended you…good. Now fix it. Great information. Call Log facility in a software can give better solutions.